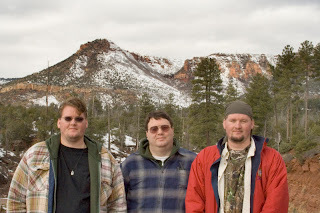 Today my brothers and I went up north to the Payson, AZ area to take pictures of the snow and other stuff. At one of the many stops I decided to video record Chris walking through the snow and here is what I recorded. Robert and I added the sound track Baby Elephant Walk to it and put it on Youtube. I think it would get great laughs on Youtube. Here are some of my pictures that I took up north, I took them for fun.